I was rather excited to have a Flavour Box delivered the other week. 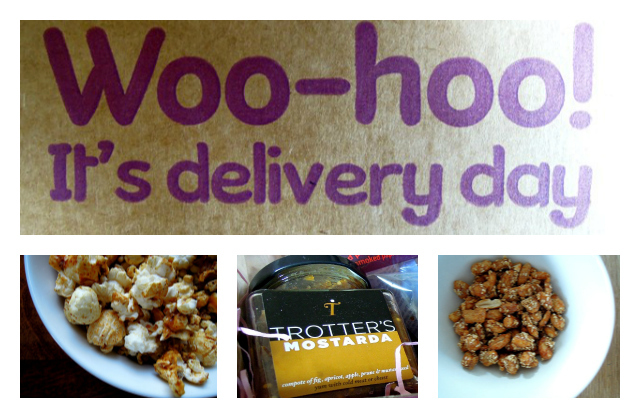 It’s always fun to receive parcels by post, and even more so when they contain food – and artisan food at that. Flavourly provides a monthly food subscription service costing £20. 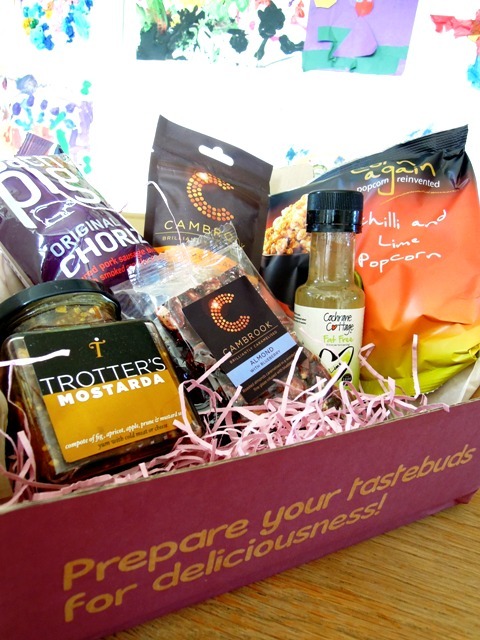 Their customers receive a monthly Flavour Box packed full of delicious, independently produced, artisan food products sourced from all parts of the UK. It costs less if you sign up for three or six months at a time. According to Flavourly’s founder, Ryan O’Rorke, the company works closely with many niche producers and by featuring their products in the Flavour Box they provide them with a solid marketing channel, getting their foods directly into the hands of foodies, small shop owners and market traders. What’s more, for every Flavour Box bought, Flavourly donates a meal to some of the 250 food banks throughout the UK through the FareShare community food charity. It sounded like a great concept to me. The idea of a surprise box of tasty foodie delights arriving each month certainly appeals and it could be a good way of discovering interesting new artisan products and producers. So of course I was up for receiving a box to try out. Cochrane Cottage Lime Salad Drizzle. It was quite a novelty opening a delivery of food and having absolutely no idea what was in there. As you probably know, I’m a big advocate of meal planning and so pretty much everything we buy and eat has been planned with almost military precision. I won’t go into detail here about why I plan meals so carefully – suffice to say it saves us lots of money by doing so and you can read more here in my very first blog post. And so opening and going through the Flavour Box felt rather exciting and very indulgent. Pretty much everything in the box got a thumbs up from my family. The sesame peanuts from Cambrook were a particular favourite with both me and my youngest daughter. We devoured the packet between us in one sitting, although my husband and oldest thought they were a bit too sweet and could clearly take them or leave them. The children unfortunately didn’t get a look in on the scrumptious chilli and lime flavoured popcorn from Corn Again. The idea of chilli as a popcorn flavouring appealed but I wasn’t too sure about the lime, but it absolutely worked, giving a fresh zingy taste with a good chilli kick that grows gradually. My husband and I polished off the packet in no time, washed down with a cold bottle of beer when the kids were in bed. Lovely. We did leave them the almond and blueberry bar, again from Cambrook, which they thoroughly enjoyed as a snack while we watched the monkeys at Longleat during the Easter holidays. Another favourite of mine is the Trotter’s Mostarda, a divine compote of fig, apricot, apple, prune and mustard seed. I am rapidly working my way through the jar, enjoying the contents whenever I eat cheese or cold meats. The Cochrane Cottage Lime Salad Drizzle is very good. It’s fresh and spicy and, at only six calories per serving, is proving a bit of God’s send on 5:2 diet days. The Bath Pig is the only brand of all those featured in the box I was already familiar with. We tried the chorizo as part of a spread with other cold meats but it wasn’t all that popular. We all agreed it tasted much better cooked when I used it in a simple dish recently of Jerusalem artichokes with a chorizo breadcrumb topping. 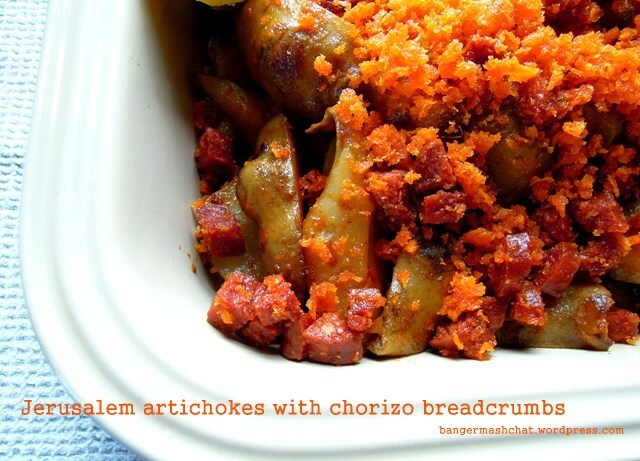 I love the way the chorizo turned the breadcrumbs bright orange! So all in all, the individual contents of the Flavour Box were extremely well received in the Bangers & Mash household. But the big question remains as to whether we’d ever consider signing up for the subscription service ourselves. While I really like the concept and probably would have signed up like a shot say ten years ago, before we had children, I probably wouldn’t these days. We’re on an extremely tight budget and although I love the surprise element, I need to carefully plan how we spend our food budget and so a monthly box like this just wouldn’t work. But for anyone in the fortunate position not to have to worry so much about their finances, I would highly recommend the Flavour Box as a fun and tasty way to have delicious and interesting new foods delivered to your doorstep. I’d also be interested if Flavourly ever introduce the option to send a Flavour Box as a gift, and I’d be dropping very unsubtle hints to friends and relatives about the existence of such a service! Flavourly is giving Bangers & Mash readers the chance to test drive a Flavour Box themselves by offering them £10 of their first box. Simply use the redemption code FLAVOURLY10 at their website checkout. Disclosure: Flavourly sent me a complimentary Flavour Box for review purposes. No money exchanged hands. Sounds like a very exciting box, particularly like the idea of sesame peanuts.